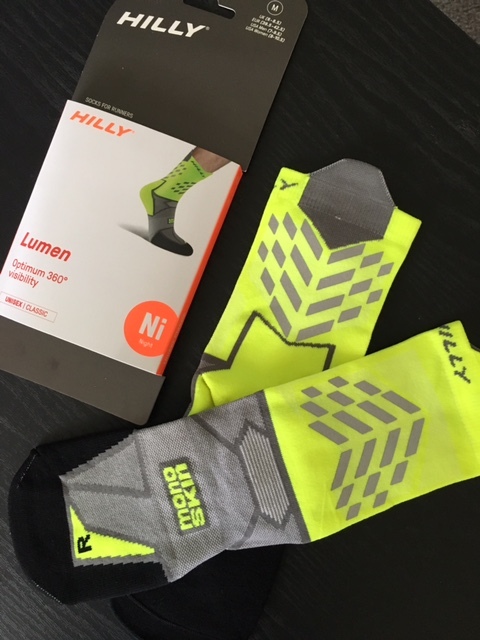 My husband recently tried the HILLY Lumen Classic - Optimum 360 Visibility Socks. These socks are unisex night sock and were size Medium. I chose not to review these socks myself, because they were too tall for my liking and he prefers a taller sock. He is currently training for Ironman. These socks are available in four unisex sizes and the only color option is the neon green/yellow color we received to review. The night time visibility is pretty amazing and I told my husband these would be great for early morning bike riding or at dusk. We are always concerned about him being visible. I recently tried the HILLY Lumen running socks on two different occasions. One to bike and the other on a run. I love the fit and feel of these socks. On the bike, I rode for 2 hours in mild temperatures (70 degrees) and had no issue with sweaty feet, the material wicked away any moisture and absolutely no discomfort of rubbing of any kind inside my cycling shoes. I love the bright visible colors as well, along with the reflective material on both the front and back. I will be wearing these again for longer rides. On my run, I had similar conditions and outcome, as far as moisture-wicking, and comfort throughout the run. My only concern, is that the socks "fell down" and shifted during the run. Not that it was very noticeable, but definitely different in comparison to other socks I wear that are cut similarly. 1. Don’t forget to stretch immediately after you race. Grab some water and hydrate while completing a short cool-down walk, followed by 5-10 minutes of stretching. Many new (and experienced) runners get all caught up in crossing the finish line (or think about collapsing) that they forget to stretch their entire body after such a grueling workout. 2. Take your bib home and write your finishing time on the back. Hopefully this is the first of many races for you. Soon all of your events will blend together in your mind. It will be fun to flip back through your bibs and your finishing times and see how much you’ve improved and where you’ve set personal records. 3. 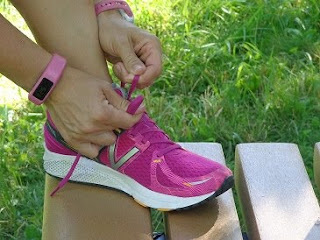 Keep track of the mileage on your shoes. Either keep track on your calendar, training log or a spreadsheet. You can even try keeping track on the shoe box. You are going to want to stay injury-free and trade in your shoes every 300-500 miles. 4. Continue running for thirty minutes three to four times a week – or every other day – to stay in 5K shape. If you were running a few days a week previously, now you can safely add another training day to your routine. 5. Schedule another 5K three to four weeks after your event to keep you motivated. This will help keep you working towards a goal. 6. If you are interested in running longer distances, find a 10K event approximately three months away to train for. Twelve weeks is more than ample time to advance from the 5K to the 10K distance. 7. Consider hiring a running coach. 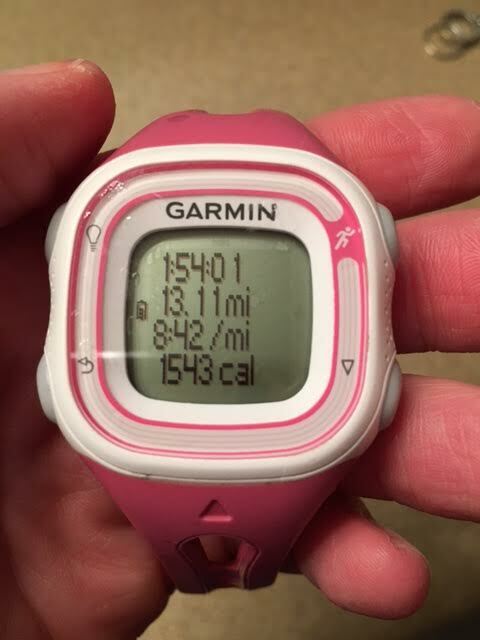 If you need a custom training program or an accountability partner, I would love to help keep you motivated and working towards your running goals. 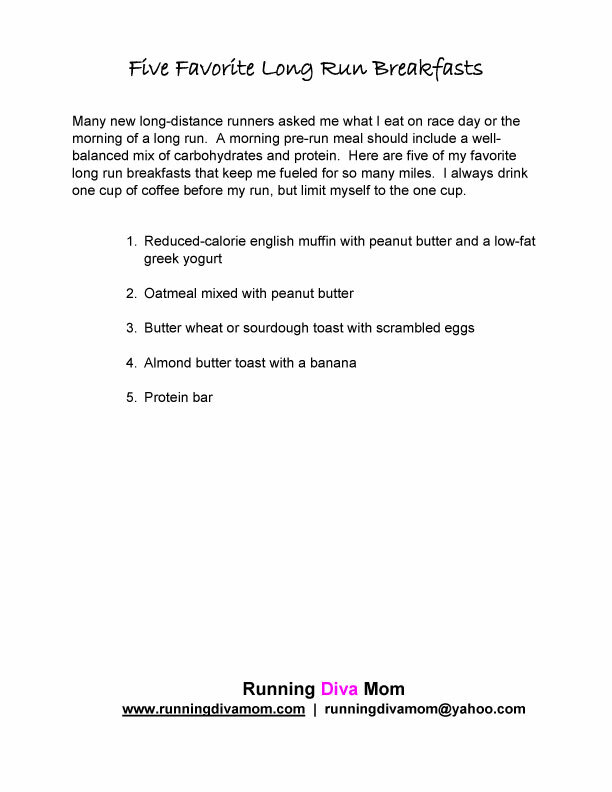 Many new long-distance runners asked me what I eat on race day or the morning of a long run. 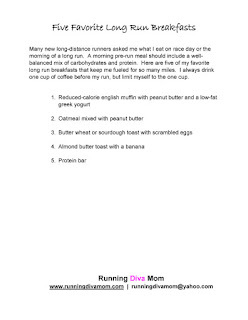 A morning pre-run meal should include a well-balanced mix of carbohydrates and protein. Here are five of my favorite long run breakfasts that keep me fueled for so many miles. I always drink one cup of coffee before my run, but limit myself to the one cup. 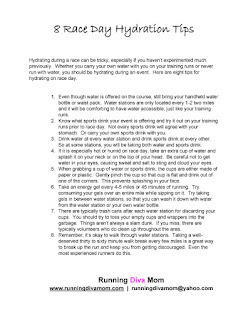 Hydrating during a race can be tricky, especially if you haven’t experimented much previously. Whether you carry your own water with you on your training runs or never run with water, you should be hydrating during an event. 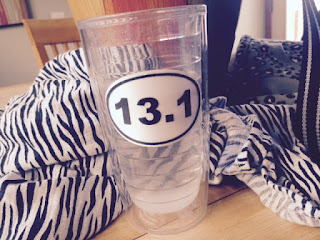 Here are eight tips for hydrating on race day. 1. Even though water is offered on the course, still bring your handheld water bottle or waist pack. Water stations are only located every 1-2 two miles and it will be comforting to have water accessible, just like your training runs. 2. 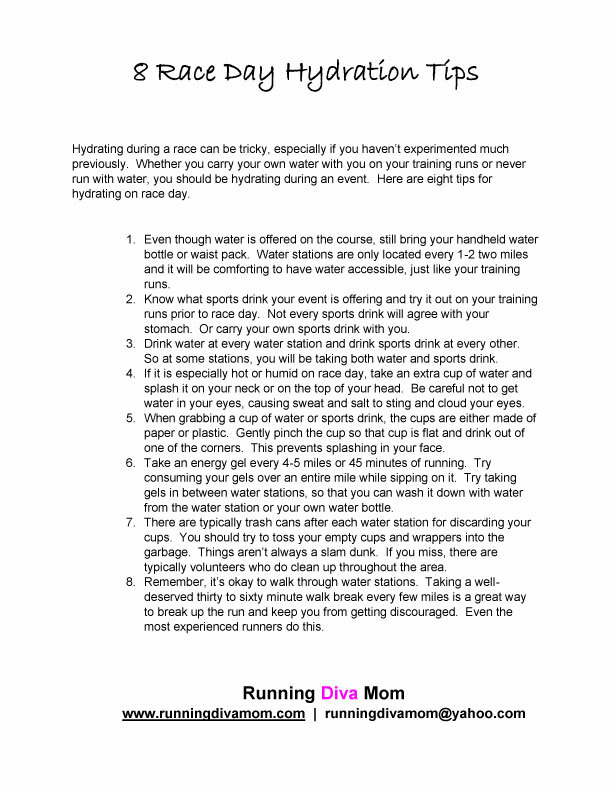 Know what sports drink your event is offering and try it out on your training runs prior to race day. Not every sports drink will agree with your stomach. Or carry your own sports drink with you. 3. 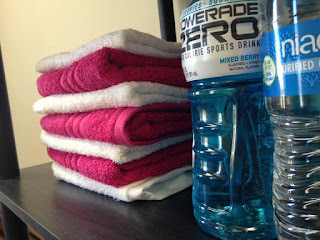 Drink water at every water station and drink sports drink at every other. So at some stations, you will be taking both water and sports drink. 4. If it is especially hot or humid on race day, take an extra cup of water and splash it on your neck or on the top of your head. Be careful not to get water in your eyes, causing sweat and salt to sting and cloud your eyes. 5. When grabbing a cup of water or sports drink, the cups are either made of paper or plastic. Gently pinch the cup so that cup is flat and drink out of one of the corners. This prevents splashing in your face. 6. Take an energy gel every 4-5 miles or 45 minutes of running. 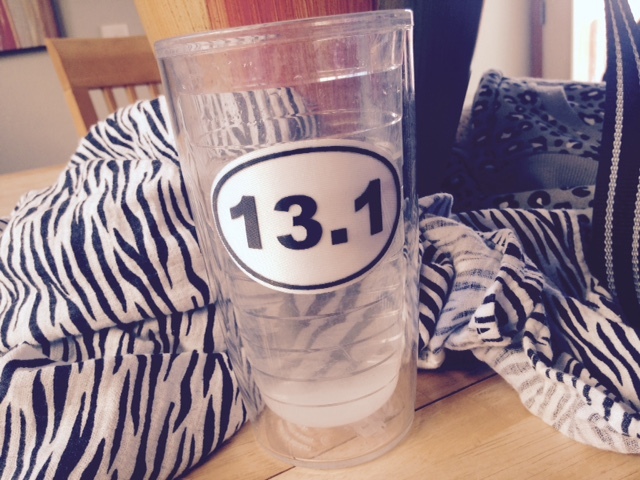 Try consuming your gels over an entire mile while sipping on it. Try taking gels in between water stations, so that you can wash it down with water from the water station or your own water bottle. 7. There are typically trash cans after each water station for discarding your cups. You should try to toss your empty cups and wrappers into the garbage. Things aren’t always a slam dunk. If you miss, there are typically volunteers who do clean up throughout the area. 8. Remember, it’s okay to walk through water stations. Taking a well-deserved thirty to sixty minute walk break every few miles is a great way to break up the run and keep you from getting discouraged. Even the most experienced runners do this. 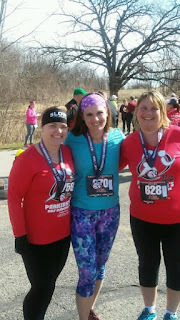 Sun Prairie is such an active community and there are so many opportunities for runners to train in town. We are so blessed to have so many community parks and trails for cycling and running. So many of the paths connect across town, making it easy to piece together a long run. Attend the Strawberry Festival Run events at the Colonial Club on June 17. Strawberry Festival offers both 5K and 10K options and a kids race. The event will also offer fresh strawberries and desserts and Strawberry Land for the kids. There is also a vendor and craft show on site. Register for the Book’n It Run events at Sheehan Park on August 5. The family-friendly event offers both 5K and 10K events, as well as a one mile run and kids fun run with local mascots. This community event also gives away several prizes to participants and funds raised benefit the Sun Prairie Public Library. 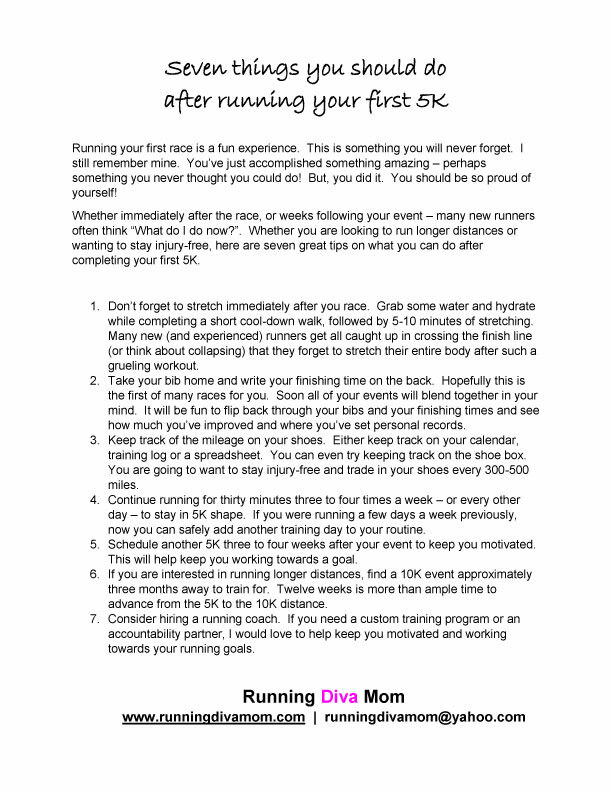 If female runners are looking for a little structure or motivation, women and mothers can join a running group with Running Diva Mom. 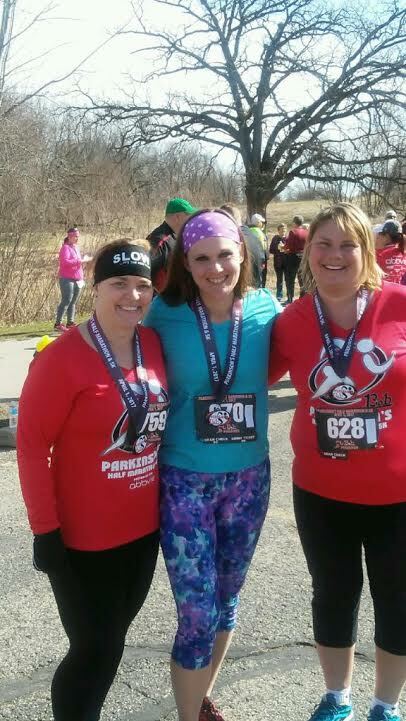 Runners will rotate several different parks and trails in Sun Prairie as they train together in a fun and encouraging atmosphere. Runners may also reserve private lessons outdoors or at the indoor running studio for women, located in downtown Sun Prairie. 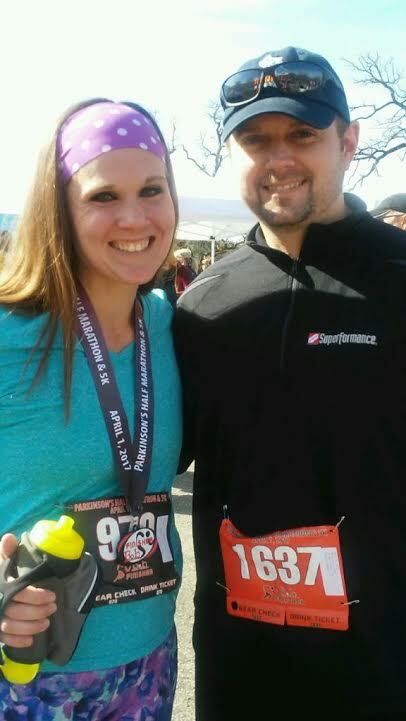 Runners are encouraged to get professionally fit for running shoes at Fleet Feet Sports in Sun Prairie. Trained specialists will watch runners walk and run and select several options that best suit their foot strike and gait. Fleet Feet also offers free weekly group runs and pub runs. I typically always run with my handheld water bottle, but am hesitant to place my phone in the zippered pouch. I am very afraid of water damage. I was excited to review the Nathan Hipster belt. This expandable storage belt is designed to fit iPhone 5, 6 and 6+ and Galaxy S4, S5 and S6. This is a great option to have your phone on you and be safe while running. You also won't risk water damage or dropping and cracking your phone mid-run. The belt is available in five sizes from XS to XL and I was sent a medium in pink. They offer seven colors - both bold and neutral for all personalities. The fabric is super soft and stretchy. After stepping-through the Hipster and easily adjusting it on my waist, it fit super comfy at the top of the waistband of my running tights. My phone fit it really easily and it would also be great for gels and chews. There were several hidden pockets - front and back. I didn't find it bouncing at all during my run, which was a welcomed surprise. The logo on the belt is also reflective for early morning or evening running. This would also be great for hands-free hiking and walking. The Hipster retails online for $24.99 and would make a great gift or stocking stuffer for that special runner in your life. Mother's Day is coming up ... just sayin'. This online bootcamp is available for individuals that are interested in starting their own running groups or offering coaching services in their area. 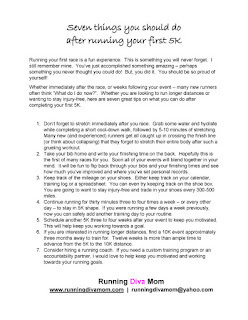 Running Diva Mom has six years of coaching experience in the Madison, Wisconsin area - primarily for women and mothers. Jamie is a Road Runners Club of America certified running coach and has lead more than 600 individuals to their first 5K and beyond. She most recently opened her own running studio for women in 2016. Jamie regularly trains runners in small groups and the private coaching setting. She will teach you all of the basics you need to get started with your own coaching business and the templates and materials she developed for her groups. She will also share what has worked well for her - and what hasn't - to keep your clients motivated, injury-free and succesful with reaching their goals. 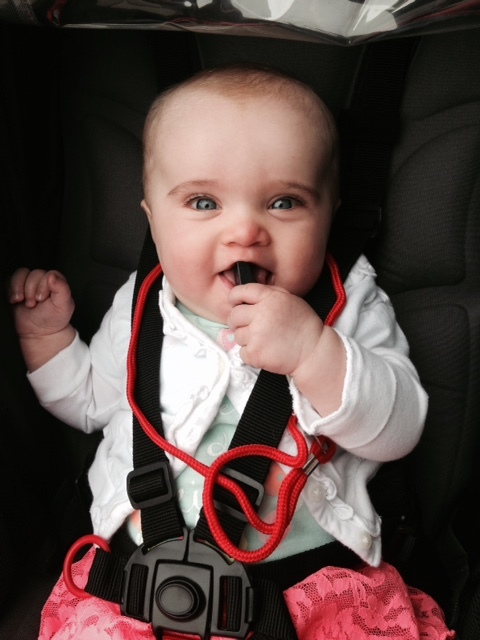 This is not a professional coaching or fitness certification. Participant with the highest percentage of weightloss will receive a FREE ENTRY into the June accountability group. 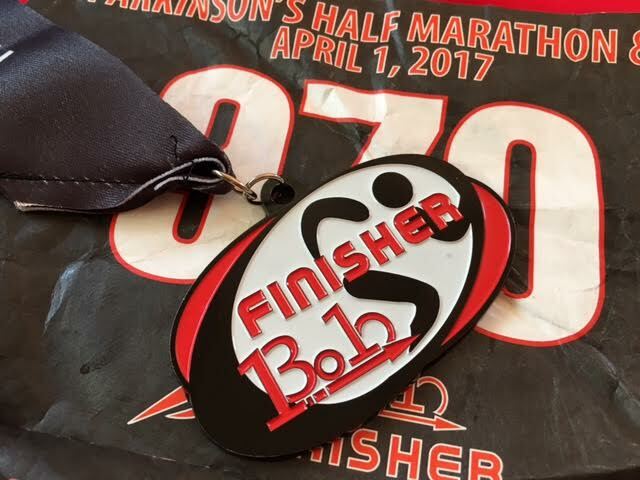 On April 1, I completed my first half marathon of the year. 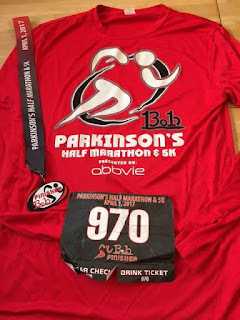 I had completed the Parkinson’s Half Marathon several times in the past several years and I always enjoy it. The race was moved up a little earlier in April this year, but they had just as gorgeous of weather as always. It is always a very well organized event and has really grown since the first event a few years ago. This year, the event had special meaning. 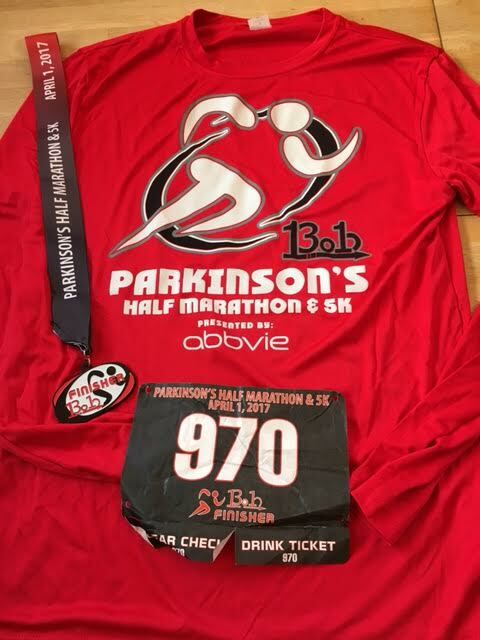 I reconnected with a high school classmate this spring, who had been diagnosed with Parkinson’s Disease. I hosted a virtual 5K for classmates, clients and friends to help raise funds for his service dog. We raised $350 in March and I presented Mike with a check prior to the race. My husband and mother-in-law were going to be walking the one mile walk my Baby Diva in the stroller. 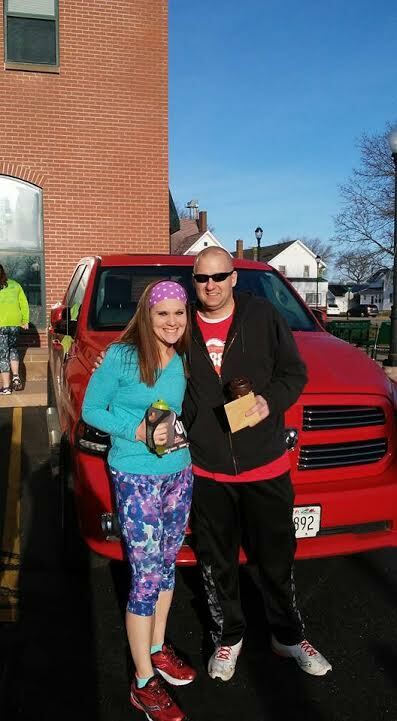 There was also a 5K event that I had several clients and friends running. I also had several clients running the half marathon. It was going to be a great morning. We obtained our packets from 1855 Saloon prior to the race. I never have found it beneficial to drive to Cottage Grove the day prior to obtain my packet. Then, we hung out in the cute coffee shop while my family had coffee and I used the bathroom (a few times). I then headed out to meet clients and friends before the race started and then to the start line at 8:00. After the National Anthem, we were off. We headed out 1.5 miles through residential neighborhood and then onto the Glacial Drumlin path. The crushed gravel is always tough to get use to during my first outing for the year. This year, there seemed to be more holes and divots than usual. It wasn’t very muddy, only a few shaded areas. We headed out on an out-and-back course and turned around at mile 7. It’s always fun (and distracting) to wave to familiar faces on this course. 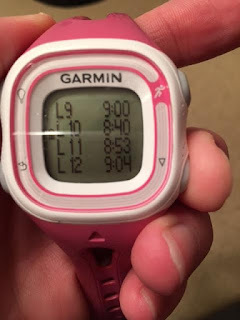 I was consistently clocking times way faster than my training pace – typically 8:10-8:30. I was feeling great and going with it. I was laid up in bed for two days, Wednesday and Thursday, leading up to the race. A bad cold had hit me hard. I still felt it in my head, but otherwise felt strong. I carried my water with me and took Gatorade at every aid station that it was offered. I was excited that they offered it in grape flavor – yum! I took Honey Stinger energy gels at miles 4-5 and 8-9. I chewed several sticks of gum to keep my mouth fresh. 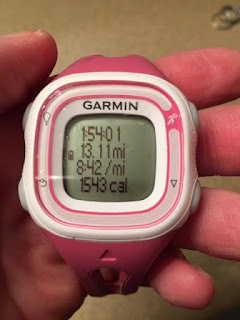 By mile 9, I was playing the numbers game. I knew that I was way ahead of pace. 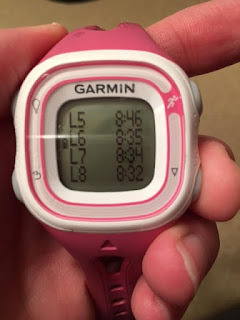 I tried to calculate my finish time, even though I was slowing down slightly. 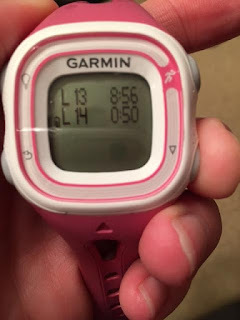 I figured I could come in under 1:58 – or maybe even 1:57 at this pace. Could I do more? 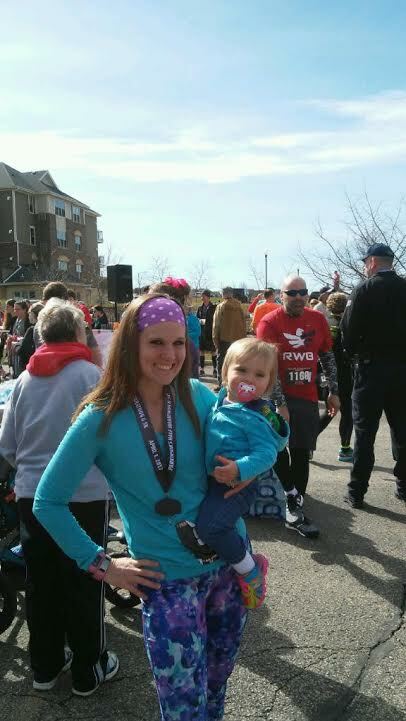 My typical finishing times pre-baby #3 were 1:58 and some change. Last year I ran this event in 2:02. This route is super flat and conditions were beautiful. I was determined to take advantage of this. I pushed forward. I played a couple songs several times the last couple of miles. I was in a groove. After enjoying a flat course, the final half mile of the race is up hill. I saw spectators and pushed up it as if it didn’t exist. 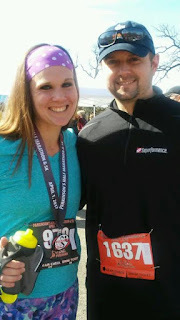 I ended up crossing the finish line in 1:54:01 with happy tears in my eyes. Those last two seconds could haunt me. But, I am extremely happy with my time. I have put in so many miles this winter with clients at my studio (127 miles in both January and February and close to 150 in March). I was ready for this. And to do it for myself. 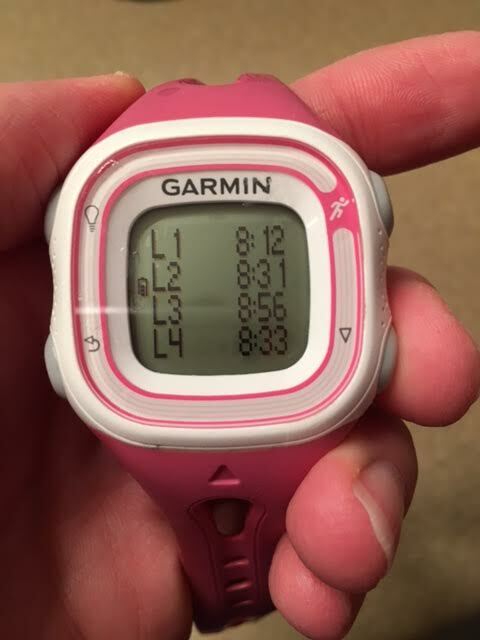 I knocked eight minutes off of my time from the year prior. I didn’t PR, but came pretty close. I hadn’t ran that fast since an event in early 2011. I quickly reunited with my family and friends. And soon I had an emotional moment with my husband. Running – and pushing yourself – are extremely moving. Only you can make that happen.